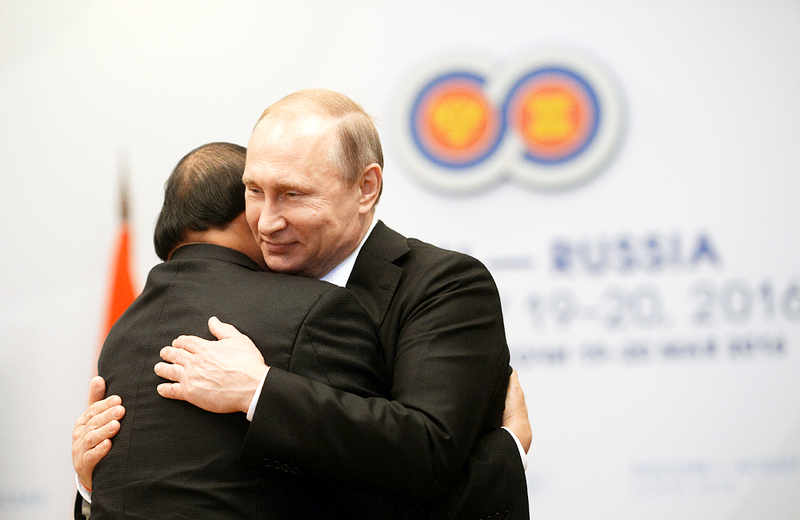 Vladimir Putin and Prime Minister of Vietnam Nguyen Xuan Phuc during a bilateral meeting in Sochi on May 19. In an exclusive interview with RBTH, Russian Ambassador to Vietnam Konstantin Vnukov spoke about the state of Russia-Vietnam ties and the economic opportunities generated by a free trade agreement between Vietnam and the Eurasian Economic Union. Now that Russia has ratified the free trade agreement between Vietnam and the Eurasian Economic Union (EAEU), what are Moscow’s expectations? The priority for us now is for a speedy ratification of the agreement by all member countries, and for its entry into force. We hope that this will happen before the end of 2016, i.e. before other preferential trade agreements important for Vietnam, primarily with the European Union, as well as on the Trans-Pacific partnership (TPP) come into effect. Is there a conflict of interest between Vietnam’s FTA with the EAEU and its entry to the TPP? I think that a comprehensive answer to this question was given by Russian Prime Minister Dmitry Medvedev after his talks with the Vietnamese Prime Minister Nguyễn Xuân Phúc on May 16 in Moscow. In his opinion, these partnerships are still evolving and it’s very important for us that both the FTA with the EAEU and the TPP are consistent with the rules of the World Trade Organization and contribute to strengthening the international trade regime. Russian Ambassador to Vietnam Konstantin Vnukov. Are there any specific industries that will help Russia and Vietnam meet their $10 billion annual trade target? For starters, there is the auto industry. In March 2016 customs tariffs for the supply of cars from Russia to Vietnam were lowered. Together with this, Vietnam created favorable conditions for the creation of car assembly facilities with the participation of Russian companies such as Kamaz, Gaz and Vaz. Besides oil production, where are the lucrative opportunities for Russian investors in Vietnam? Small and medium businesses can play a large role in increasing trade and investment cooperation with Vietnam. There is already some progress in this area. Medipal Onko, a pharmaceutical company that is willing to export medicines to Vietnam, including cancer drugs, has opened a representative office in the country. This year the administration of Ho Chi Minh City purchased video conferencing equipment manufactured by Spirit, a Russian company. In late March, Tolyatti-based Sagama launched an automobile tire recycling plant near Hanoi. And what is happening in the oil sector? Three Russian companies have been working in Vietnam for years: Zarubezhneft, Rosneft and Gazprom. They not only produce oil and gas, but also search for new forms of cooperation. For example, Russia’s Gazprom Neft is looking to buy a stake in Vietnam's only refinery Zung Kuat, which is in need of capacity expansion and modernization. While the deal, as far as I know, has been postponed, the company plans to return to this issue after a public offering. Another example is a joint project between Gazprom and PetroVietnam that involves the switching of municipal vehicles in Ho Chi Minh City to a new type of fuel that meets the highest modern environmental standards. Now, as far as I know, they are in the final stages of creating a joint venture. Given the active work of PetroVietnam’s subsidiaries in the oil and gas fields of Russia, our cooperation with Vietnam in the energy sector, as emphasized by Dmitry Medvedev, “is unprecedented.” Medvedev noted how Russia and Vietnam have even exchanged oil fields. Despite the longstanding relationship between the two countries, why are there so few Russian investments in Vietnam? According to Vietnamese statistics, the accumulated Russian investments now amount to $2.1 billion and are present in 113 projects. Overall, it's not that small. Our investments in Vietnam are more than Germany’s and Italy’s combined. But it's not just about numbers. Statistics, as you know, are not always reliable. Russia seeks to expand its investment presence in Vietnam, not only in quantitative but also qualitative terms. I am sure that we have all the possibilities. During visit to Russia the new Prime Minister of Vietnam Nguyễn Xuân Phúc signed an agreement on creating a Russian-Vietnamese investment platform amounting to $500 million. Half of this will be injected by the Russian Direct Investment Fund and half by the Vietnam's State Investment Fund. The platform intends to invest in companies and projects that strengthen bilateral trade and the development of medium and large Vietnamese enterprises in Russia. What is the scope for Vietnamese investments in Russia? Vietnam has a number of strong competitive advantages, especially in the field of agriculture and manufacturing. In Russia, these industries are now being actively developed and are open to foreign investment. I think that Vietnamese businessmen should pay close attention to them. However, some steps have already been taken. One of the pioneers here was Vietnamese agricultural holding TH True Milk, which has already begun to establish dairy production in the Moscow and Kaluga Regions, and the total amount of declared investments is about $2.5 billion. I can also advise businessmen from Vietnam to pay attention to Russian regions. There they can find land at a more reasonable price, and the production costs are lower than in Moscow. The main factor to look for is the commitment shown by the leadership in the regions in attracting foreign investors. Suffice to say that over the last year, the governors of St. Petersburg, Primorye, Moscow and Kaluga regions visited Vietnam. Many delegations from other Russian regions also visited the country. Is there any indication that after the closing of Egypt and Turkey for Russian tourists, part of the tourist traffic shifted to Vietnam? The number of Russian tourists here is growing significantly. For all of 2015, the number was 340,000. In January-April of this year it has already reached 144,000, which is 16 percent higher than during the same period last year. It is difficult to say whether Vietnam can be seen as a full replacement for Turkish and Egyptian resorts. ‘All inclusive’ beach tours – the most sought after by Russians – are virtually absent in local hotels. And flights to Vietnam are longer and more expensive. At the same time, Vietnam has a number of important benefits, including a visa-free regime for up to 15 days, lack of serious security problems and, of course, an always positive attitude of local residents towards Russians. I want to note that, by cooperating with Vietnam in the field of tourism, we seek to establish the flow of tourists not only from Russia to Vietnam, but in the opposite direction as well. As you know, now our government pays great attention to the development of domestic and inbound tourism, and attracting foreign visitors to Russia. This should be facilitated by the ‘Visit Russia’ tourist offices, one of which was recently opened in Hanoi. Its goal is to acquaint the people of Vietnam and other countries in the region with the tourism potential of our country. I am convinced that this undertaking has good prospects, given how quickly in Vietnam and other Southeast Asian countries, a growing middle class is willing to spend money on travel. People in this part of the world have an interest in Russia, almost from childhood. What joint steps can Russia and Vietnam take to ensure security and stability in the region? Russia and Vietnam are traditional partners for cooperation in the field of defense and security. Suffice it to say that at least two-thirds of weapons and military equipment of the Vietnam People's Army is produced in our country, and many experts were and are now undergoing training in Soviet and Russian universities. Moreover, talking about our military-technical cooperation, we think not only about past but also about present and future. As we all know, the main topic for our military exports in recent years has been the upgrading of the Vietnamese Air Force and the creation of a submarine fleet. We are interested in maintaining security and stability in the Asia-Pacific region, which occupies an increasingly important place in world politics and economics. Here we have very specific economic interests, including mining projects, oil and gas and nuclear energy. Leading Russian companies are involved in these areas. As for the situation in the South China Sea, I can only repeat Russia’s position that has been repeatedly expressed by the Russian leadership. Our country is interested in the settlement of disputes exclusively by peaceful means on the basis of equal dialogue between the parties involved and taking into account the universally recognized norms and principles of international law, including the relevant UN Convention of 1982. At the same time, we oppose the unnecessary politicization of the issues and the interference of third countries, the purpose of which, we think, is often to not resolve the existing differences, but pushing their own opportunistic geopolitical interests. Are there any difficulties in the Russia-Vietnam relationship? How serious is the problem with illegal Vietnamese migrants? Relations between Russia and Vietnam, in my opinion, can be called exemplary. This is a very rare occasion when states have neither long-standing historical problems nor significant contradictions in the present. This is due, of course, not only to the legacy of a glorious past, but also to the great attention we now pay to the development of bilateral relations. In the last fifteen years, exchanges of visits at the highest levels have been as intense as they were in the Soviet era. These meetings are not just symbolic. They allow very fast and efficient means to discuss all the complex issues and “push” bilateral matters ahead. As for the temporary difficulties in the relationship, yes, we admit there are some, it’s normal. Illegal migration has recently become an increasingly acute problem for our society and sometimes citizens of Vietnam are mentioned in this context. According to various estimates, there are between 25,000 and 100,000 Vietnamese people in Russia. Some of them have already become a part of the Russian society, making a significant contribution to the development of the economy, culture and education educations sector of the country. Others come to study or work in the country. The most problematic is the category of labor migrants. Among them there are those who stay in Russia longer than the period of their visa, thus violating our laws. This, incidentally, is not a purely Russian story. There are illegal Vietnamese immigrants in a number of other countries including Japan, Taiwan and South Korea. We know that Vietnam attaches great importance to the protection of the rights of its compatriots abroad and makes all the necessary efforts to solve the existing problems in the spirit of our comprehensive strategic partnership. Relevant agencies of the two countries have started an intensive dialogue in the framework of specially established working groups on migration and temporary employment. I am sure that the results of this work will be able to create reliable mechanisms of control over migration flows from Vietnam to Russia and to ensure employment activities are within legal parameters.